The Town of Colma, known worldwide as the "City Of Souls," is the smallest city in San Mateo County with over 1,509 residents and 1.5 million "souls." However, Colma is mor e than just cemeteries. Colma's commercial buildings make a distinct architectural statement resulting from design standards that encourage Spanish-Mediterranean motifs. Colma boasts an old-world charm all its own, from its paving stone residential streets and ornamental street lamps to its restored historical museum and railroad depot located at its 5,500 square foot Community Center. The state-of-the-art Police Station complements the architecture of the historic and charming Town Hall across the street. Within its two square mile boundary, the Town enjoys a strong tax base with two shopping centers, one of Northern California's most complete collections of car dealerships and a cardroom. There are two BART Stations nearby. The Town's five-member City Council sets government and planning policies. 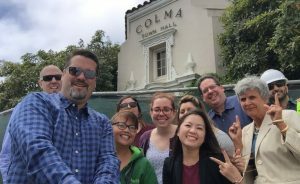 Colma has a modern infrastructure with a professional staff who are easily accessible to residents and local businesses. A monthly newsletter is distributed with timely information about the City Council Agenda, upcoming community events and special interest articles. This small-town approach to modern, municipal government reflects a commitment to both a healthy business climate and a harmonious relationship with residents.